The final section of this chapter describes recommended practices for creating your own workspace. 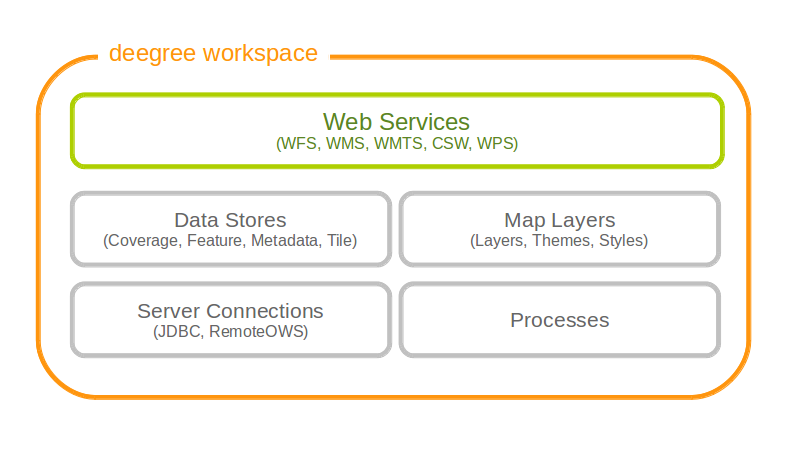 The remaining chapters of the documentation describe the individual workspace resource formats in detail. Physically, every configured resource corresponds to an XML configuration file in the active workspace directory. 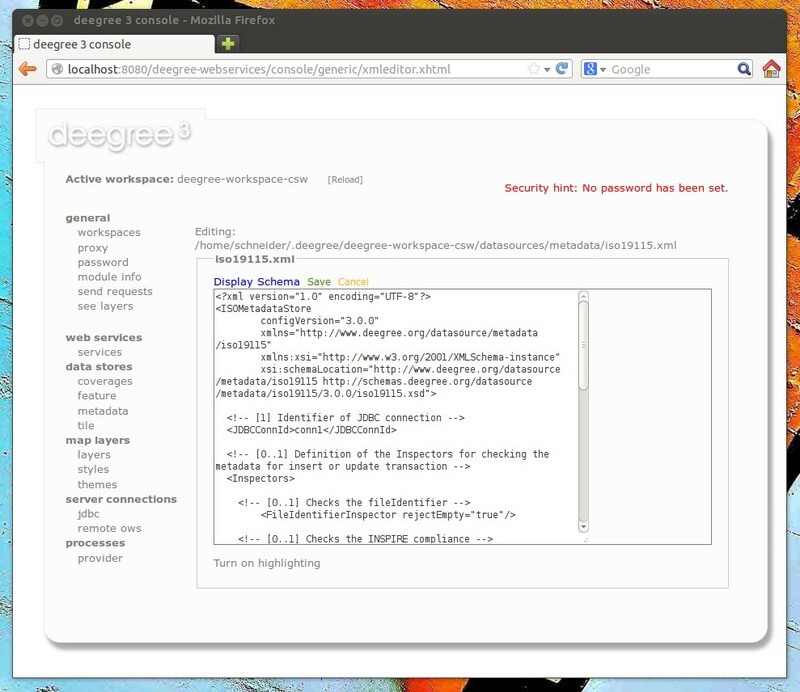 The active deegree workspace is part of the .deegree directory which stores a few global configuration files along with the workspace. The location of this directory depends on your operating system. On UNIX-like systems (Linux/Solaris/MacOS X), deegree’s configuration files are located in folder $HOME/.deegree/. Note that $HOME is determined by the user that started the web application container that runs deegree. If you started the ZIP version of deegree as user “kelvin”, then the directory will be something like /home/kelvin/.deegree. In order to use a different folder for deegree’s configuration files, you can set the system environment variable DEEGREE_WORKSPACE_ROOT. Note that the user running the web application container must have read/write access to this directory. On Windows, deegree’s configuration files are located in folder %USERPROFILE%/.deegree/. Note that %USERPROFILE% is determined by the user that started the web application container that runs deegree. If you started the ZIP version of deegree as user “kelvin”, then the directory will be something like C:\Users\kelvin\.deegree or C:\Dokumente und Einstellungen\kelvin\.deegree. Note that only a single workspace can be active at a time. The information on the active one is stored in file webapps.properties. Usually, you don’t need to care about the three files that are located at the top level of this directory. The service console creates and modifies them as required (e.g. when switching to a different workspace). In order to create a deegree webservices setup, you will need to create or edit resource configuration files in the active workspace directory. The remaining documentation will always refer to files in the (active) workspace directory. When multiple deegree webservices instances run on a single machine, every instance can use a different workspace. 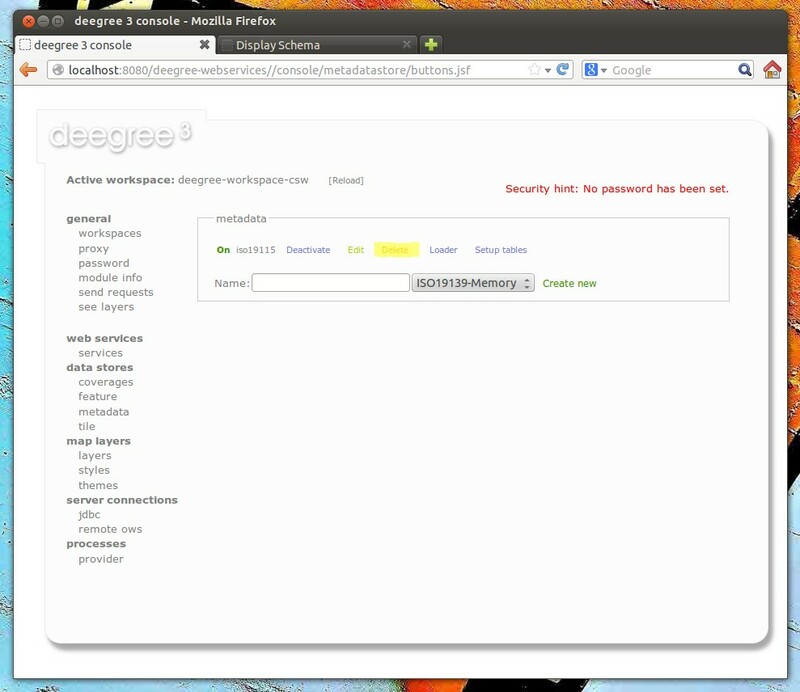 The file webapps.properties stores the active workspace for every deegree webapp separately. The individual XML resource formats and their options are described in the later chapters of the documentation. You may wonder why the main.xml and metadata.xml files are not considered as web service resource files. These two filenames are reserved and treated specifically. See Web services for details. The configuration format has to match the workspace subdirectory, e.g. metadata store configuration files are only considered when they are located in datasources/metadata. In this example, the ISO metadata store is wired to JDBC connection pool conn1. Many deegree resource configuration files contain such references to dependent resources. Some resources perform auto-wiring. For example, every CSW instance needs to connect to a metadata store for accessing stored metadata records. 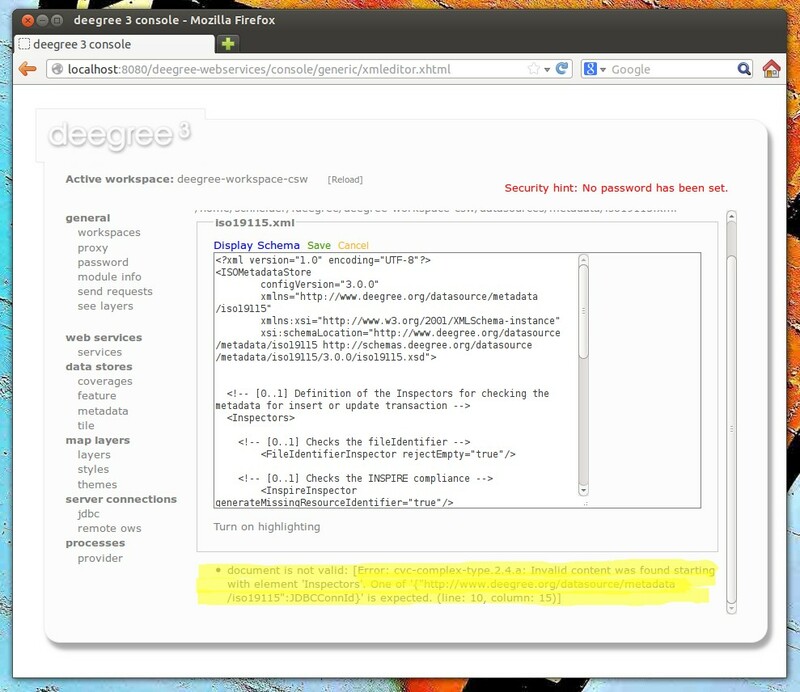 If the CSW configuration omits the reference to the metadata store, it is assumed that there’s exactly one metadata store defined in the workspace and deegree will automatically connect the CSW to this store. The required dependencies are specific to every type of resource and are documented for each resource configuration format. Although the console offers additional functionality for some resource types, the basic management of resources is always identical. The right part of the window displays a table with all configured metadata store resources. In this case, the workspace contains a single resource with identifier “iso19115” which is in status “On”. When a resource is being deactivated, the suffix of the corresponding configuration file is changed to ”.ignore”. Reactivating changes the suffix back to ”.xml”. Display Schema: Displays the XML schema file for the resource configuration format. Turn on highlighting: Perform syntax highlighting. In this case, the mandatory “JDBCConnId” element was removed, which violates the configuration schema. This needs to be corrected, before “Save” will actually save the file to the workspace directory. The next steps depend on the type of resource, but generally you have to choose between different options and the result will be a new resource configuration file in the workspace. As you see, the problem with the service resource (“There is no MetadataStore configured, ensure that exactly one store is available!) is actually a consequence of the other issue. 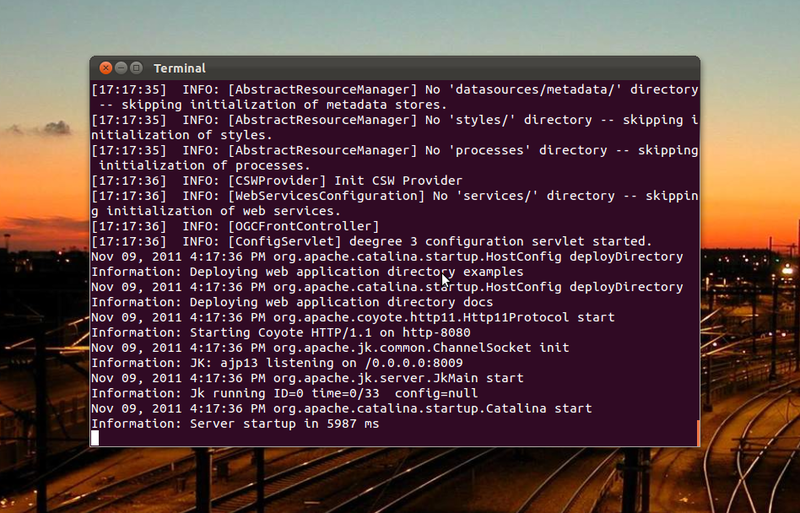 Because deegree couldn’t initialize the metadata store, it was also unable to start up the CSW correctly. If you add a new JDBC connection “conn1” and click on “[Reload]”, both problems should disappear. 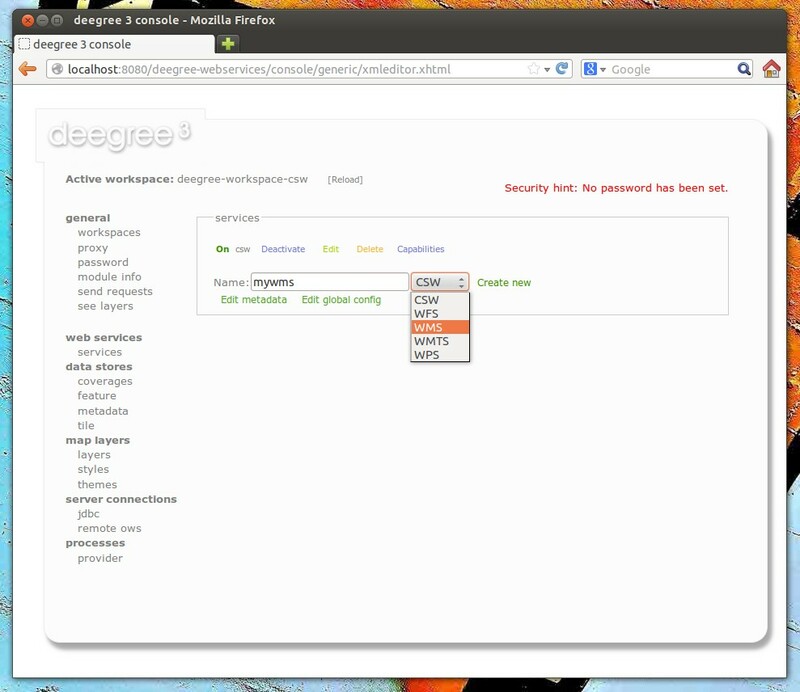 This section provides some hints for creating a deegree workspace. For creating your own workspace, you have two options. Option 1 is to use an existing workspace as a template and adapt it to your needs. Option 2 is to start from scratch, using an empty workspace. Adapting an existing workspace makes a lot of sense if your use-case is close to the scenario of the workspace. For example, if you want to set up INSPIRE View and Download Services, it is a good option to use Example workspace 1: INSPIRE Network Services as a starting point. 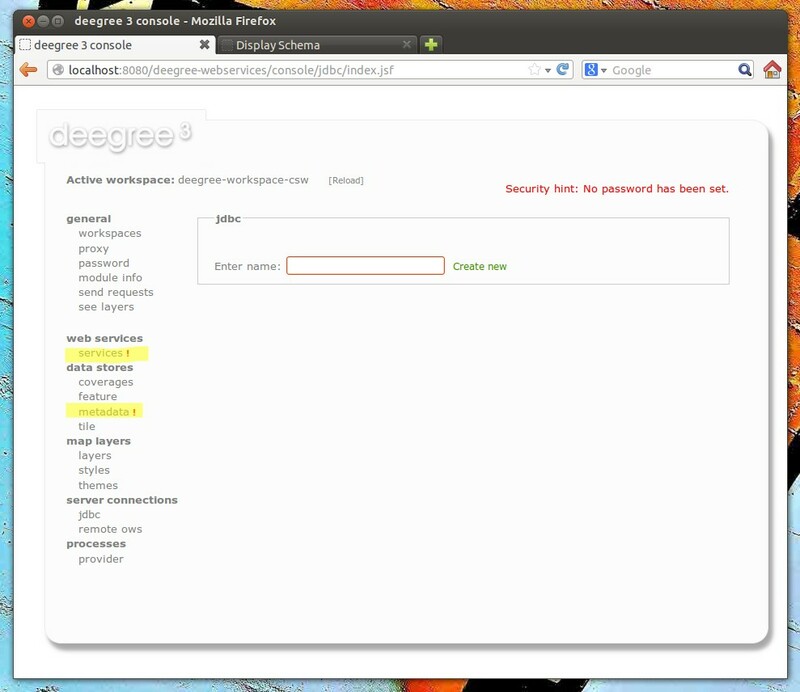 In order to create a new workspace, simply create a new directory in the .deegree directory. Afterwards, switch to the new workspace using the services console, as described in Downloading and activating example workspaces. On which resources does this resource depend? At the end of this process you should know about the resources that you will have to configure for your setup. Alternatively, you can approach the resources question bottom-up. Let’s say you have your data ready in a PostGIS database. You want to visualize it using a WMS. So you would require a JDBC resource pool that connects to your database. You need a simple SQL feature store (or an SQL feature store) that uses the new connection pool. You create one or more feature layers that are wired to the feature store and a theme based on the layers. At the end of the chain is the WMS resource which has to be configured to use the theme resource. Rendering styles can be created later (references have to be added to the layers configuration). If you prefer to use a different editor for editing deegree’s configuration files, it is highly recommended to choose a validating XML editor. Successfully tested editors are Eclipse and Altova XML Spy, but any schema-aware editor should work. In case you are able to understand XML schema, you can also use the schema file to find out about the available config options. deegree’s schema files are hosted at http://schemas.deegree.org. In this case, it was not possible to initialize the JDBC connection (and the resources that depend on it). You can spot resource categories and resources that have errors easily, as they have a red exclamation mark. Click on the respective resource level and on “Errors” near the broken resource to see the error message. After fixing the error, click on “Reload” to re-initialize the workspace. If your fix was successful, the exclamation mark will be gone. Additional information can be found in the deegree log. If you’re running the ZIP version, switch to the terminal window. When initializing workspace resources, information on every resource will be logged, along with error messages. 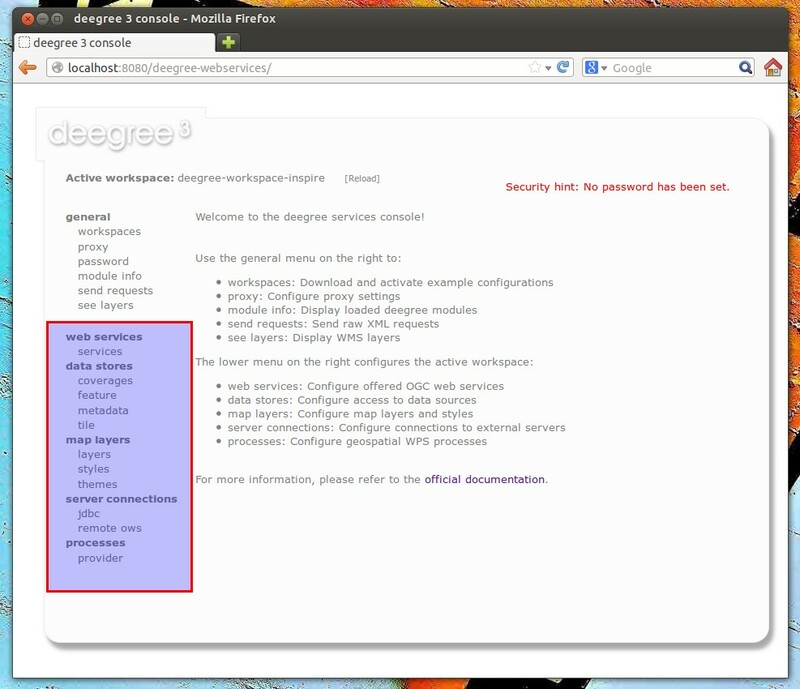 If you deployed the WAR version, the location of the deegree log depends on your web application container. 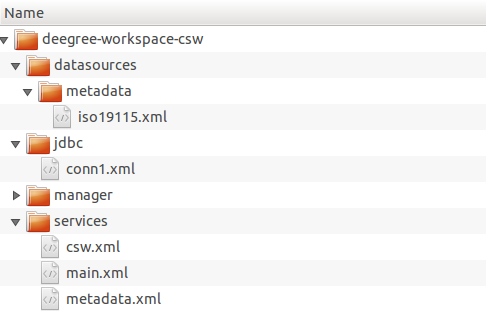 For Tomcat, you will find it in file catalina.out in the log/ directory. More logging can be activated by adjusting file log4j.properties in the /WEB-INF/classes/ directory of the deegree webapplication.